A new project which aims to tackle the problem of street drinking has been introduced as a result of partnership work in Ealing. 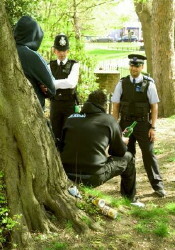 Launched jointly between Ealing Police, Ealing Council, Ealing DAIS (Drug, Alcohol, Intervention Service) and Thames Reach, it aims to offer street drinkers support with their addictions through outreach work whilst addressing the anti social behaviour caused through their behaviour. It's designed to reduce the number of alcohol-related offences as well as offer a positive intervention in social aspects of life associated with alcohol abuse like health, public confidence or homelessness. Special teams with representatives of all the organisations participating will conduct borough-wide patrols on a weekly basis. Warning letters will be issued to those found drinking in public areas. Most persistent offenders will be asked to sign ABCs (acceptable behaviour contracts) which can be followed by ASBOs (anti-social behaviour orders) if necessary, breaches of which may result in arrest and prosecution. “The project’s goal is to reduce anti-social behaviour across the borough and improve public confidence. We have a real opportunity to engage with the street drinkers, to get them the support they need by helping them with their addiction, finding accommodation and addressing their behaviour. Those who do not wish to engage with us will be subject of ASBO applications, which will be rigorously enforced”.